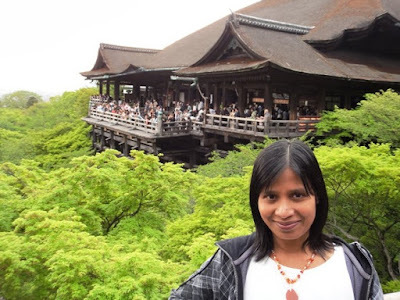 As I wrote in the previous post, on the afternoon of 30th April hubby and I visited Ginkakuji Temple in Kyoto. In the evening, we visited Kiyomizudera Temple about which I will write in this post. Kiyomizudera Temple is formally known as Otowa San Kiyomizudera and is located halfway up Otowa Mountain in the eastern part of Kyoto city. The temple originally belonged to Hosso sect of Buddhism but formed its own Kita-Hosso sect in 1965. 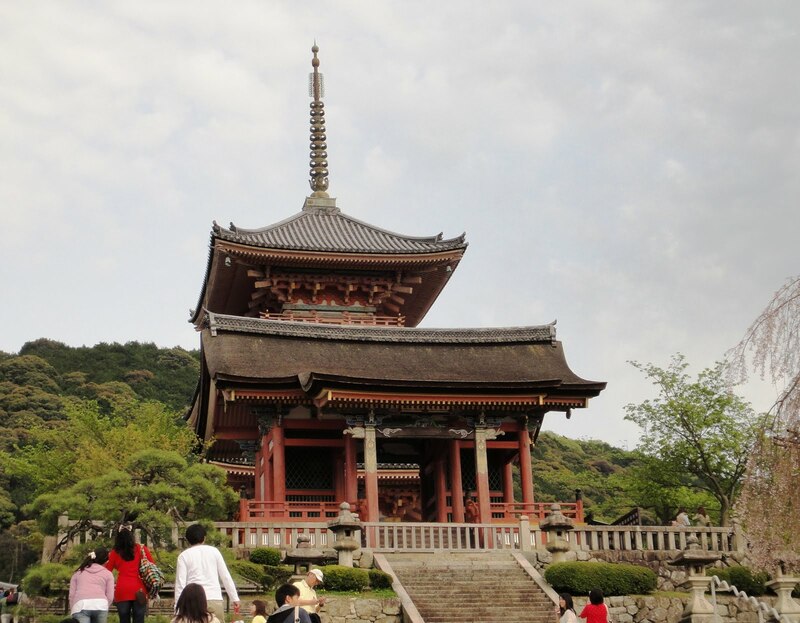 The temple was founded in 778 during Nara period by a Buddhist priest named Enchin in honor of Kannon Bosatsu. There is a legend that says that Enchin had a vision of finding a golden stream of clear water flowing from Otowa Mountain into Yodogawa River. During the search for the stream, he came across an old hermit named Gyoei who practiced asceticism. 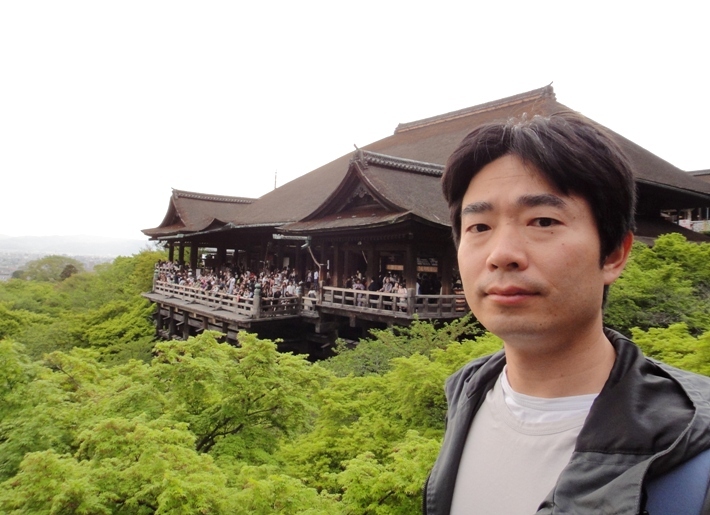 Gyoei gave Enchin a piece of wood and went for pilgrimage. Enchin waited for a long period of time but the hermit seemed to have disappeared and did not return. So Enchin went in search of the hermit and found the hermit’s sandals on top of the mountain. Suddenly it dawned on Enchin that he had met and talked with Kannon himself. Enchin then carved the piece of wood into an image of Kannon Bosatsu which was enshrined in a small thatched roofed hut. 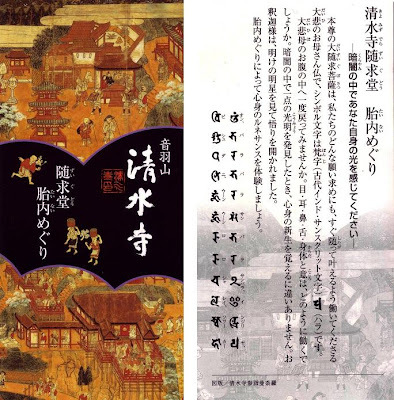 The legend further states that Sakanoue Tamuramaro, one of the generals of Emperor Kammu, met Enchin while hunting for stag. Tamuramaro’s wife was going to give birth and the blood of a stag was thought to ease the pain of childbirth. Enchin spoke of the cruelty of killing animals and preached compassion for them. The speech moved Tamuramaro so much that he disassembled his house and gave it to the temple as an act of repentance. 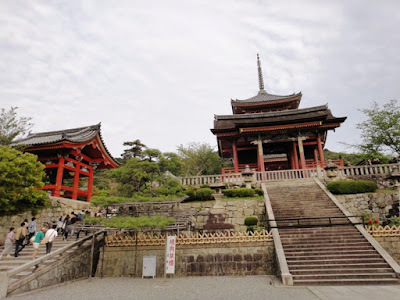 In 794 during the first year of Heian period, Emperor Kammu moved his capital to Kyoto and gave Tamuramaro his throne hall as a reward for his military service. Tamuramaro, in turn, donated this building to Enchin for a new main hall of the temple. 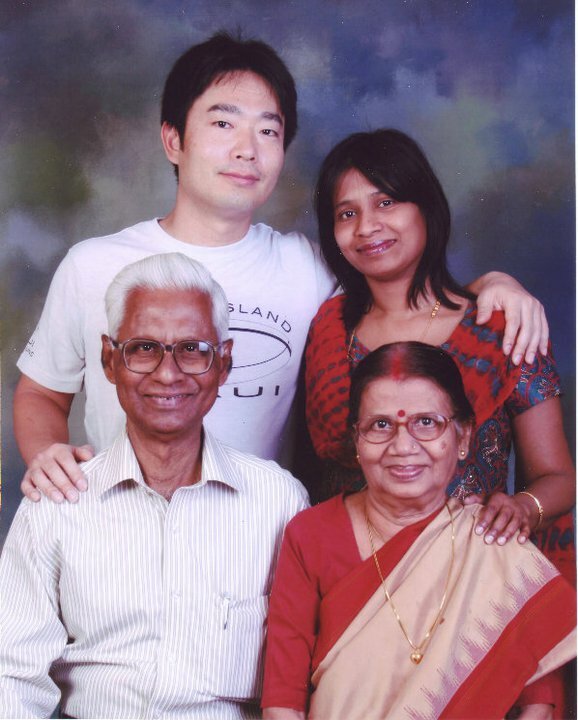 Since its foundation, the temple has burned down many times. 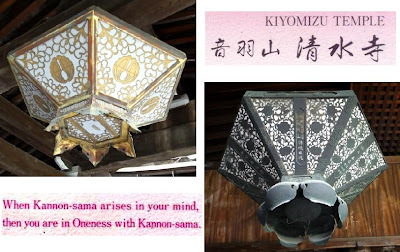 In the late 16th century Toyotomi Hideyoshi spent time at the temple and left behind many personal objects, some of which still remain today. 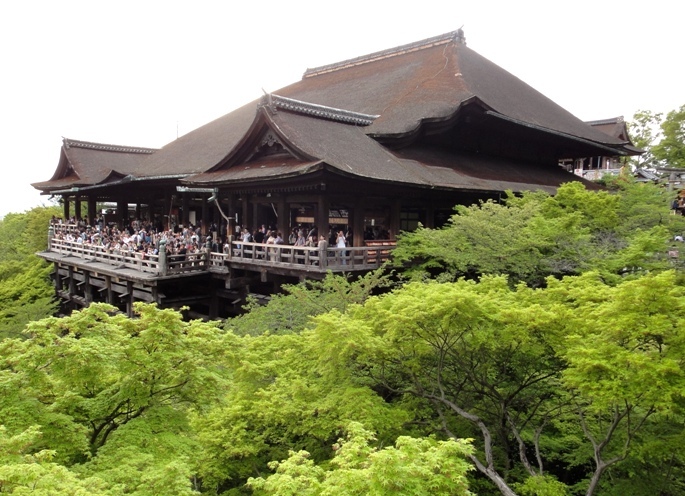 The temple grew in the early 17th century but a fire in 1629 destroyed almost all the original buildings. 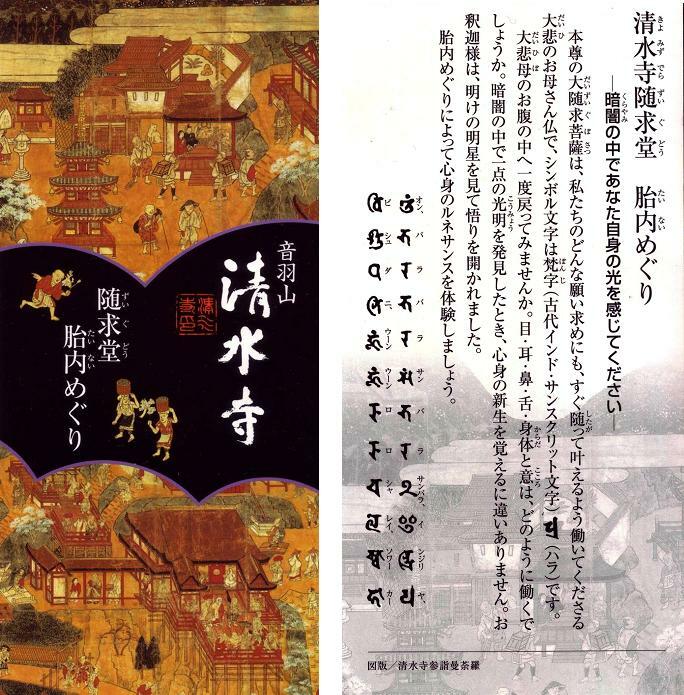 Most of the present buildings were rebuilt by Tokugawa Iemitsu, the third shogun of Tokugawa Shogunate, in 1633 during Edo period. 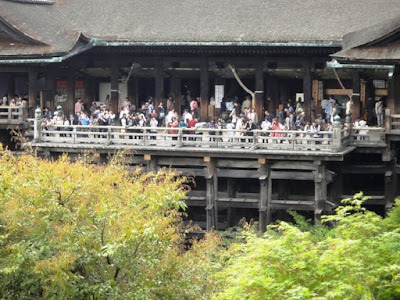 Present day temple complex has an area of about 130000 square meters and consists of over 30 structures. In 1994, the temple was registered on the UNESCO world cultural heritage list as one of the historic monuments of ancient Kyoto. Kiyomizudera Temple is located about six kilometers south of Ginkakuji Temple and it took us 25 minutes to reach there by Taxi. After getting down from the taxi, we walked up the steep and narrow stone paved lanes lined with souvenir shops and food stalls. 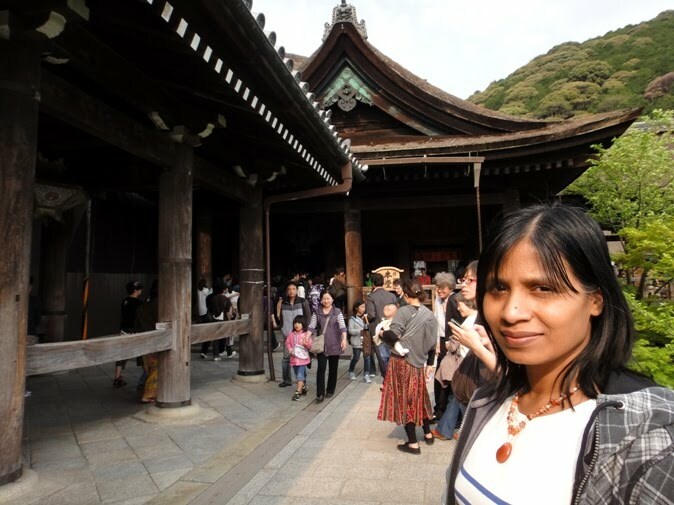 After 15 minutes of walking, we reached the front of Kiyomizudera Temple complex. It was about 3.45 pm when we reached the temple. 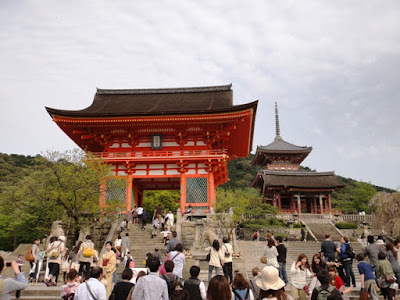 At the front of the temple complex, we saw a magnificent red colored gate named Niomon. 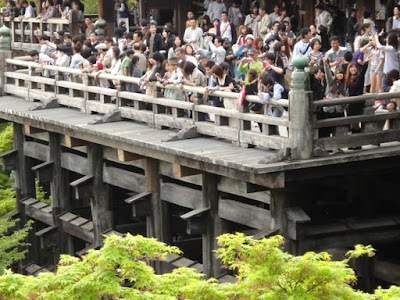 This gate was destroyed during Onin war but was rebuilt soon by the end of 15th century. The gate was dismantled and repaired in 2003, and therefore now it is beautifully covered in bright red color. 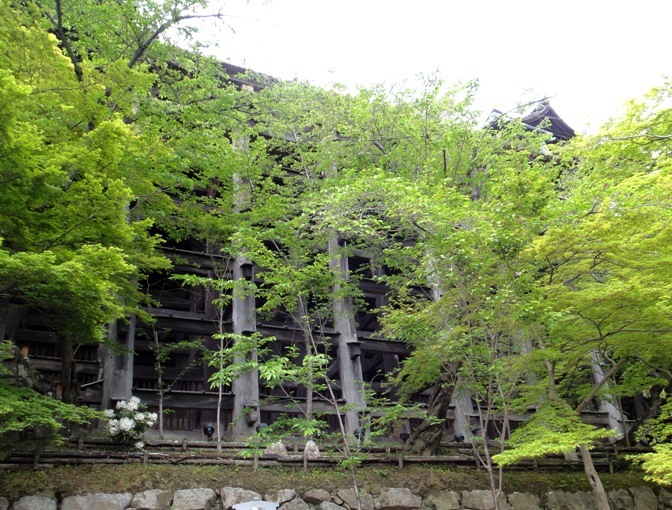 The gate is 14 meters high, 10 meters wide, and 5 meters deep, and shows the typical features of Muromachi period. 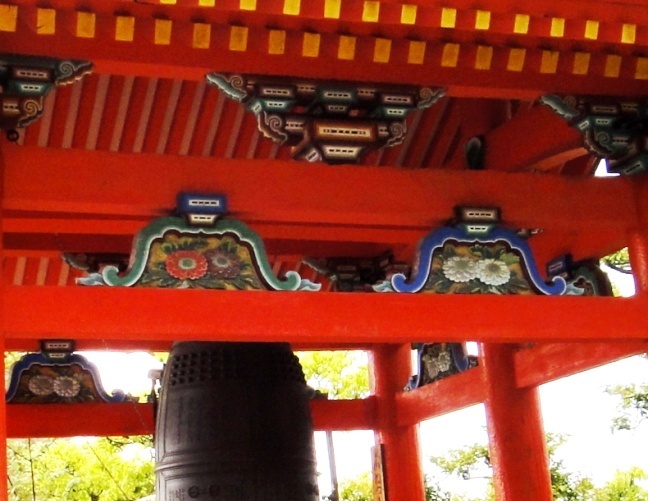 A pair of Nio deities and a pair of lion-dogs komainu stand guard on either side of the gate, and are believed to protect the temple from any evil. 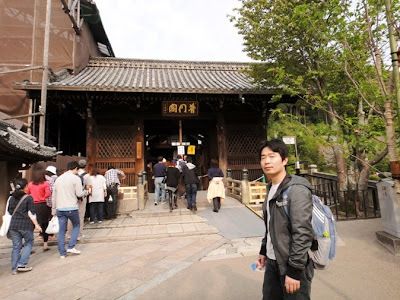 Walking past Niomon gate, we reached another gate named Saimon west gate. It is located slightly southeast of Niomon gate. 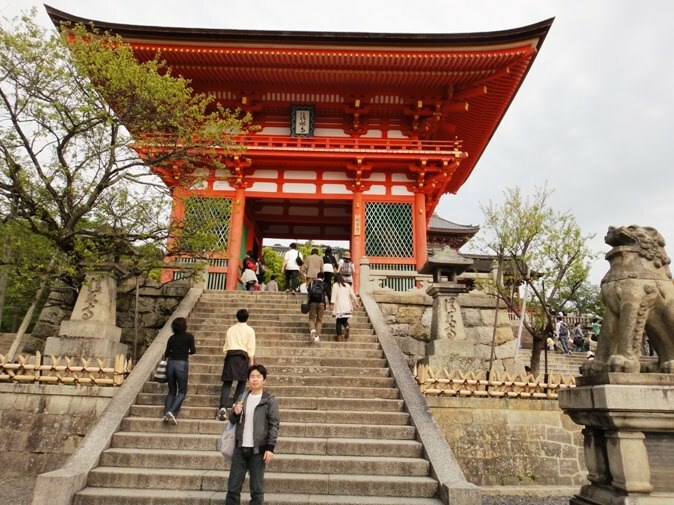 Although the exact year of the construction of the original Saimon gate is unknown, it is believed to have been built at the end of Heian period or the beginning of Kamakura period. 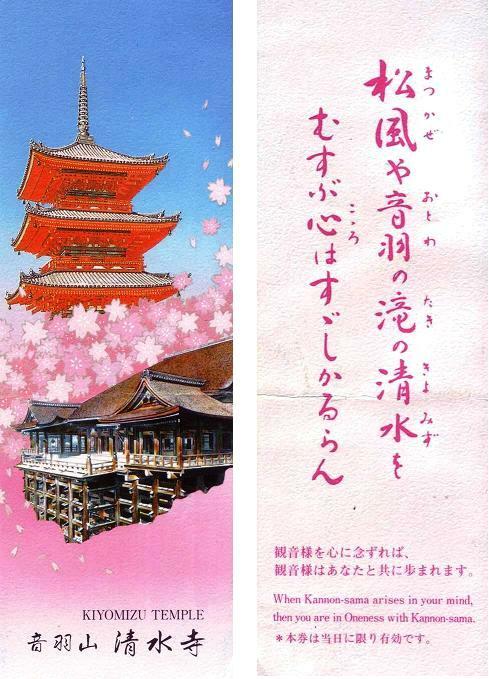 The present gate was reconstructed in 1631 during Edo period. In 1994, the roof was restored and the entire gate was colored in red. Two Nio statues stand guard on either side of the gate. 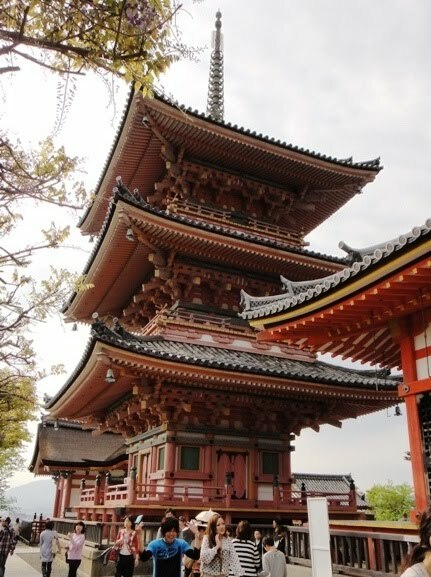 There is a three-storied pagoda behind the gate and a bell tower to the left of the gate. 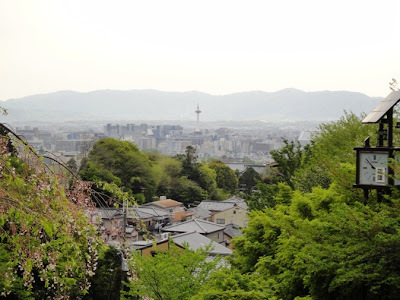 Near Saimon gate we turned around and got a beautiful view of Kyoto city. 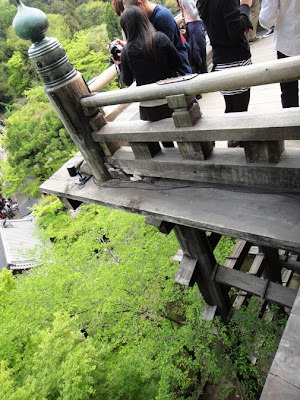 After enjoying the views of the city, we again concentrated back on the temple structures. 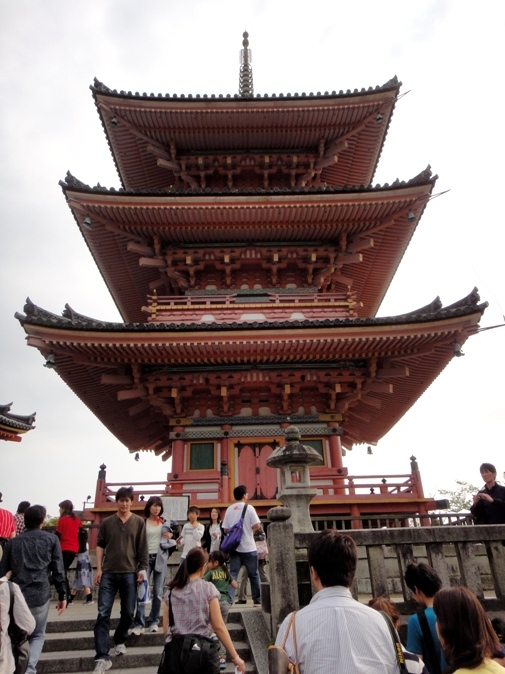 To our left we saw Shoro bell tower that was built in 1607 during Edo period. The bell tower was restored in 1999 that revived its spectacular red color. 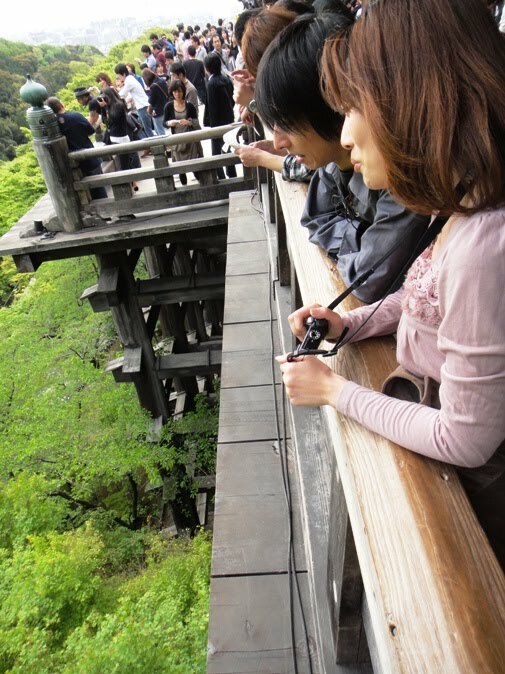 Beautiful chrysanthemum flowers are carved above the flying brace of the tower. 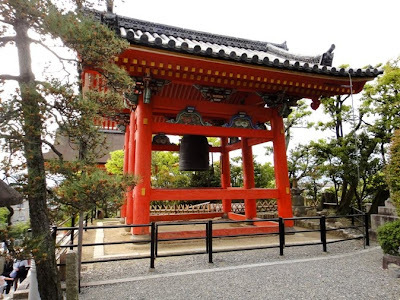 The bell that was cast in 1478 during Muromachi period used to be inside the bell tower until 2008, when it was retired due to progressive fatigue and now is kept in a treasure house inside the temple complex. The present bell is just 3 years old. Next we saw a building named Zuigudo hall that is located towards east right in front of the bell tower. Daizuigu Bosatsu, mother of Buddha, is the principal image of worship in this hall. 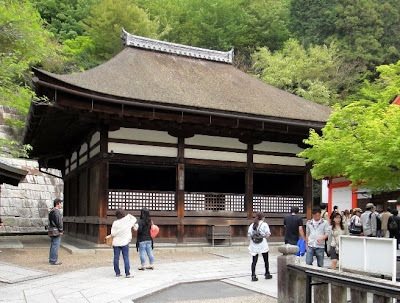 The hall was rebuilt in 1718 during Edo period, and was dismantled and repaired in 2006. 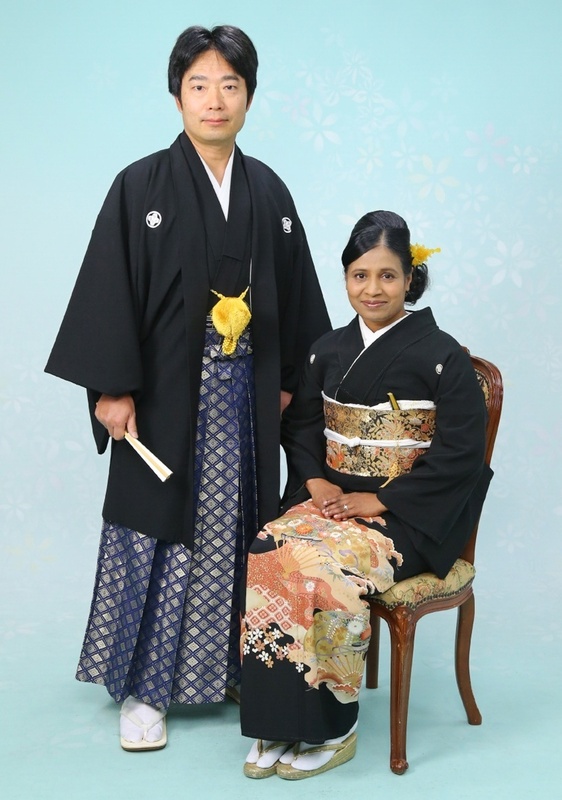 We paid 100 yen per person as admission fee for entering the hall. We could not see anything inside the hall because it is pitch dark inside. The darkness symbolizes the womb of a mother. We walked down to the basement of the hall through the darkness grasping a rope tied to the side of the wall, and made a wish while circling a big stone inside. It is said that the goddess can grant our any wish. After making a wish, we started walking back up in the darkness. When the daylight hit us, it was supposed to be like a new beginning. A three-storied pagoda called Sanjunoto is an adjacent building located southwest of Zuigudo Hall. In fact, earlier while entering the temple premises we got a nice view of the pagoda just behind Saimon west gate. 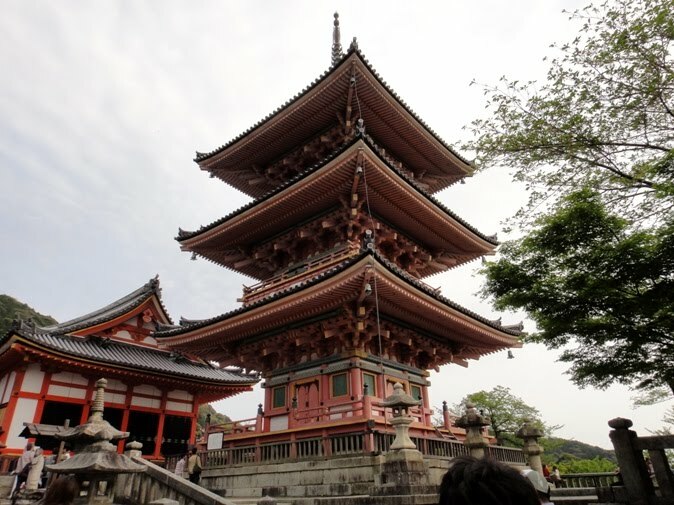 The pagoda was built in 847 during Heian period. 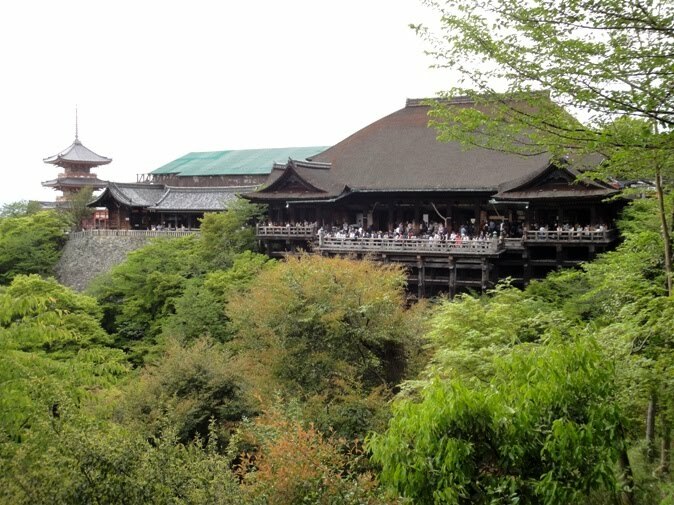 It was rebuilt in 1632 during Edo period. In 1987, the building was dismantled, repaired, and repainted in the original red color. The building is 31 meters high and is the tallest three-storied pagoda in Japan. It is a gorgeous structure with rich architectural beauty. 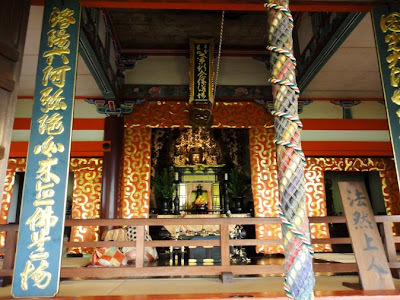 There is an image of Dainichi Nyorai inside the pagoda building. We took several photos of the pagoda from various sides and angles. 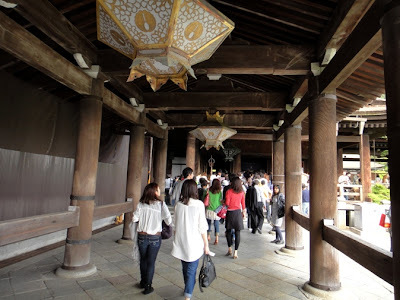 After seeing the pagoda, we reached a ticket counter where we purchased tickets worth 300 Yen per person as admission fee to the paid area of the temple precincts. The tickets looked so elegant. 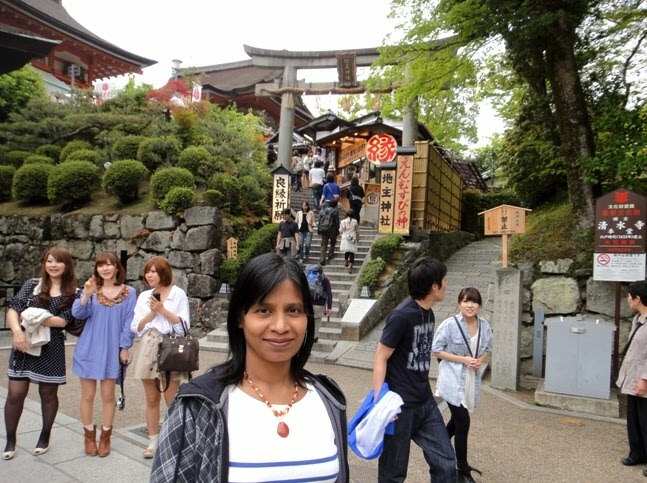 We then passed through Todorokimon middle gate of the temple. This gate was rebuilt in 1633 during Edo period. The roof structure of this gate resembles Tengaimon gate of Todaiji Temple located in Nara. A pair of Nio statues stands guard on either side of the gate. This gate leads to the approach to the main hall of the temple. Next, we walked through a roofed passage that led to the main hall. 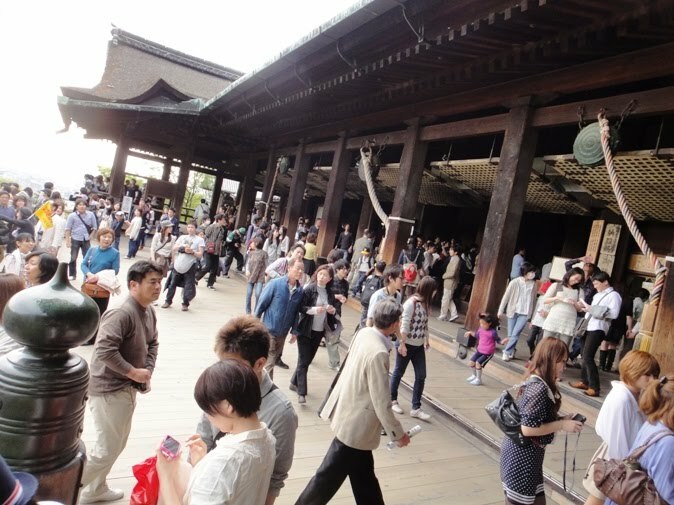 There are huge wooden columns on either side of the passage. A row of lanterns hanging from the roof of this passage look so elegant and graceful. 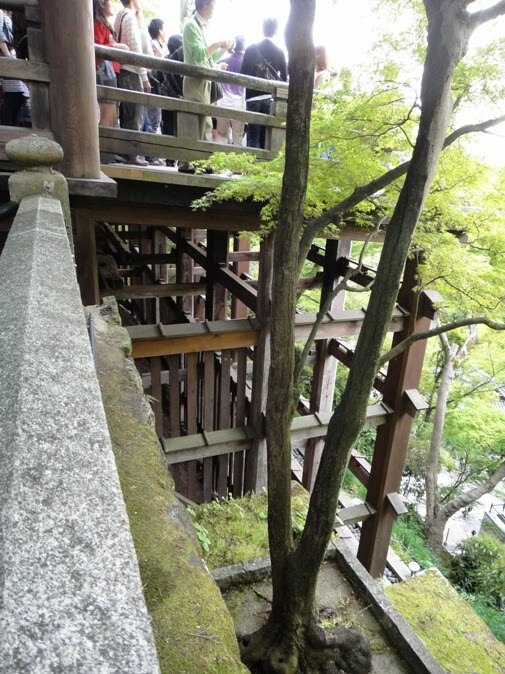 As we neared the end of the passage, we went to the porch area and enjoyed the greenery in front of us. From this angle, we got a lovely view of the roof of Hondo main hall. 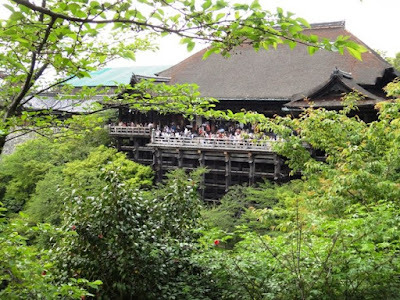 Hondo main hall is the main attraction of the temple and is designated as a national treasure. The hall is dedicated to Kannon Bosatsu. The original building donated by Tamuramaro was destroyed by a fire in 1629 during Edo period. The present structure was rebuilt in 1633 in the original Heian period palace style architecture. 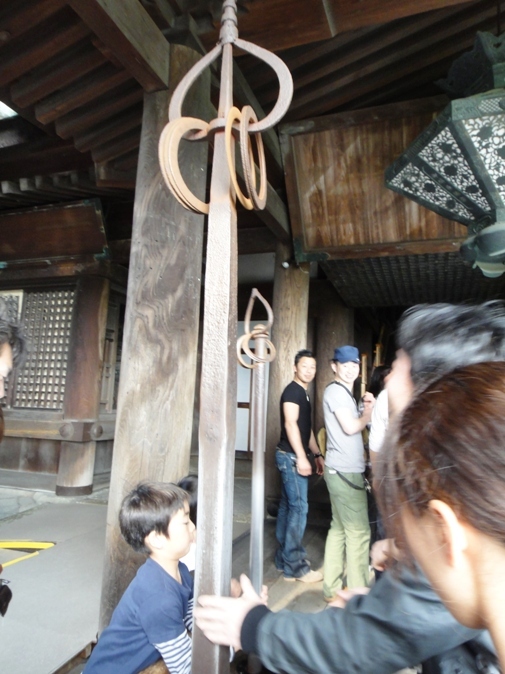 A pair of metal staff (priest’s cane) is displayed at the west side entrance of Hondo building. Heavier one named Tetsushakujo weighs 90 kilograms and the smaller Shoshakujo weighs 14 kilograms. 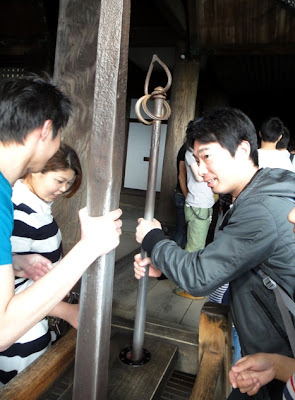 Visitors were encouraged to try and lift the staffs. Although hubby could not lift the heavier staff, he could easily lift the lighter one. 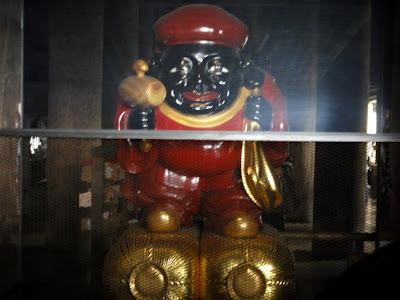 While walking in the corridor of Hondo main hall, we saw a cute statue of a deity named Shusse Daikokuten. The statue is kept outside towards the west side of the main hall. It is a deity of success and progress in career. The deity has a smiling face, stands on rice bags, and wears a red hood. In addition, the deity has a treasure bag on its left shoulder and holds a magic mallet in the right hand. The statue was repaired in 2008. We loved the wooden architecture of Hondo main hall. We were appreciating the magnificent style of the roof of the hall building when we noted that the corridor ceiling has a unique lattice structure. Next we entered inside the hall building where the first thing we noticed was a row of huge floor-to-ceiling wooden columns. While the outer sanctuary of the hall is rather simple, the inner sanctuary is gorgeous and has many gold-leaf images. 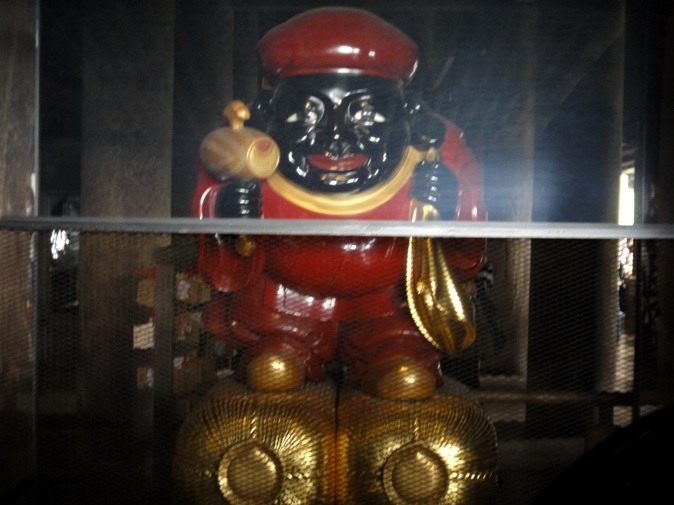 Priest Enchin's image of Kannon Bosatsu is kept inside a case resting on a platform. 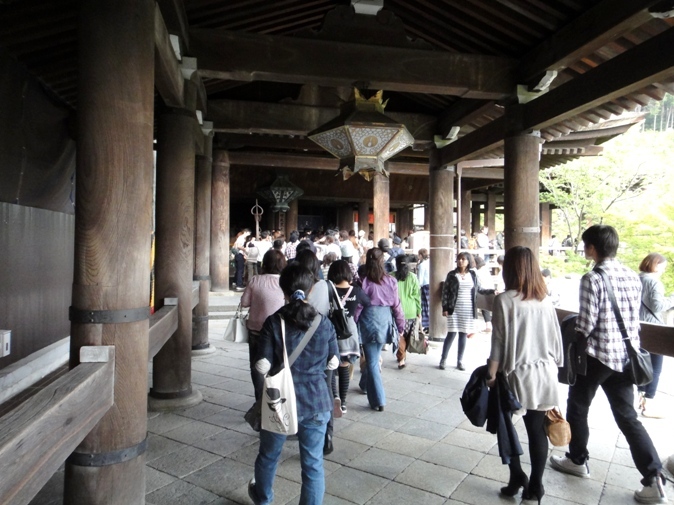 In the east of the hall is an image of Bishamonten and the west houses an image of Jizo Bosatsu. Since photography is not allowed inside the main hall, I do not have any photos of the hall interior. Then we came outside the main hall and saw a stage named Butai which is the veranda of the main hall. 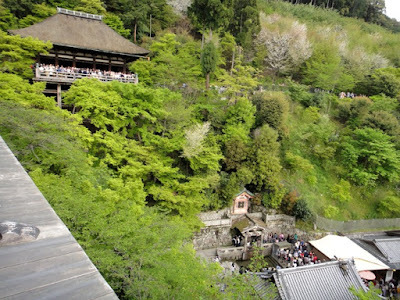 The stage is held up by wooden scaffolds that extends the stage 10 meters over a 12 meter cliff. The stage was built using a special method where huge 12 meter high keyaki tree pillars were assembled without using a single nail. A total of 139 pillars and 90 crossbeams support the stage. The floor of the stage was installed using more than 410 hinoki cypress boards. The stage has an area of 190 square meters, and was originally used for kabuki, kyogen, and sumo wrestling. There is an expression in Japanese ‘to jump off the stage at Kiyomizudera’ which is equivalent to the English expression ‘to take the plunge’. This refers to Edo period tradition that one’s wish would be granted if one were to survive jumping from the stage. Of course, this practice is prohibited now. From Butai stage, we got impressive and wonderful views of the temple surroundings and the city. To the southeast of the main hall, we saw a beautiful building named Okunoin hall. This hall resembles the main hall on a smaller scale and also has a stage. At the base of the main hall we saw a waterfall named Otowa no taki. From the stage we took several photos of the temple surroundings. 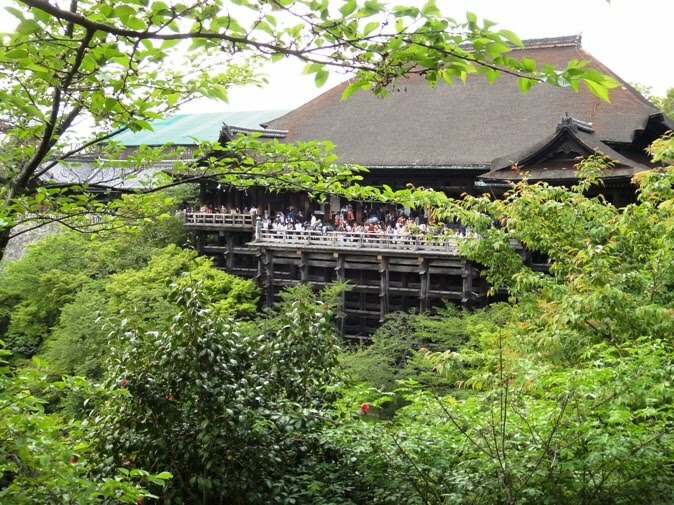 Next, we walked further east and climbed a few wooden steps of the main hall building. From this spot, we got a perfect view of Butai stage and the front of the main hall. The architectural design of the stage is superb. 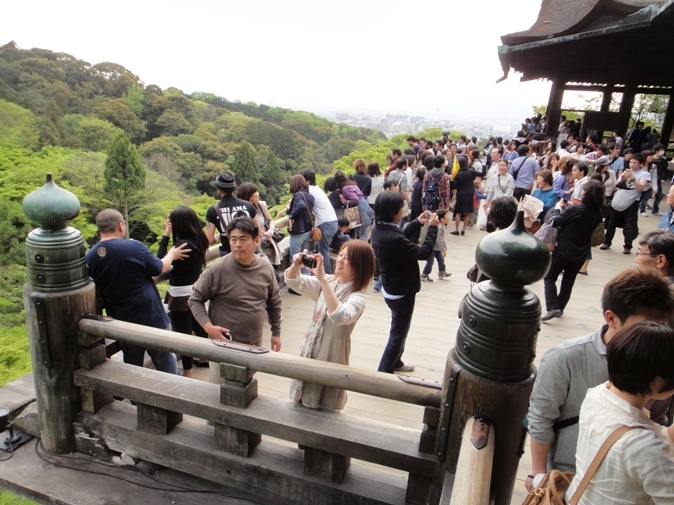 There were many tourists enjoying the temple views from this famous stage and therefore we had some difficulty to take photos of the stage. After enjoying the views for some more time, we left the main hall building. 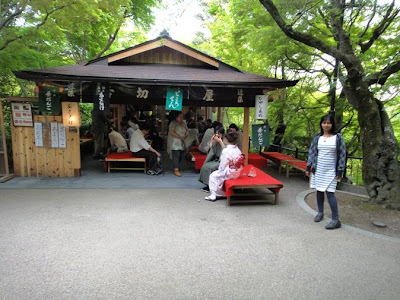 Next, we saw a shrine named Jishu Jinja located in the north just behind the main hall. In Japan it is common to find Shinto shrines in Buddhist temple precincts. 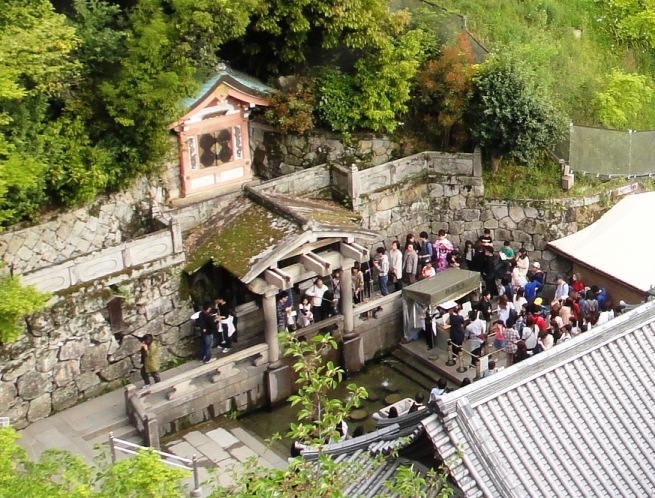 Jishu Jinja is dedicated to the deity of love and matchmaking. A Torii gate and a large staircase lead to the shrine grounds. We climbed the staircase but decided to skip visiting the shrine as we did not have much time. After coming down the stairs of Jishu Jinja, we turned left and walked towards the east on a pathway that brought us to a line of buildings. 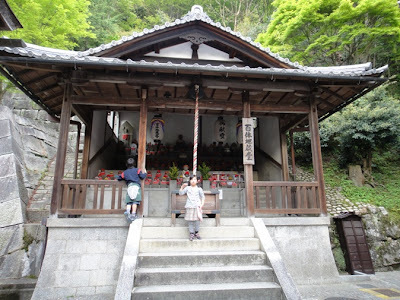 The first building is a hall named Shakado. 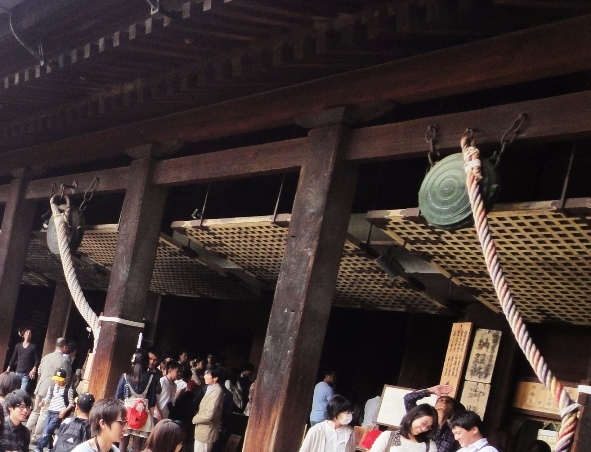 The hall building was rebuilt in 1631 during Edo period. The building was damaged in heavy rain in 1972, and so it was reconstructed after three years. Although the exterior of the hall looks simple, the interior has a gorgeous decor. The inside is lacquered and the ceiling is painted. The principle image of the hall is Shaka Sanzon which is a triad consisting of an image of Shaka Nyorai in the center flanked by images of Monju Bosatsu and Fugen Bosatsu. To the southeast of Shakado hall, there is a small hall named Hyakutaijizodo. 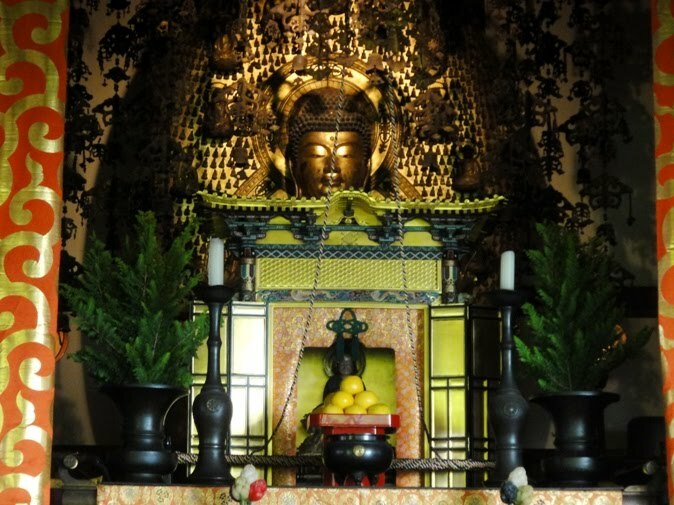 There are about 200 stone statues of Jizo Bosatsu inside the hall. 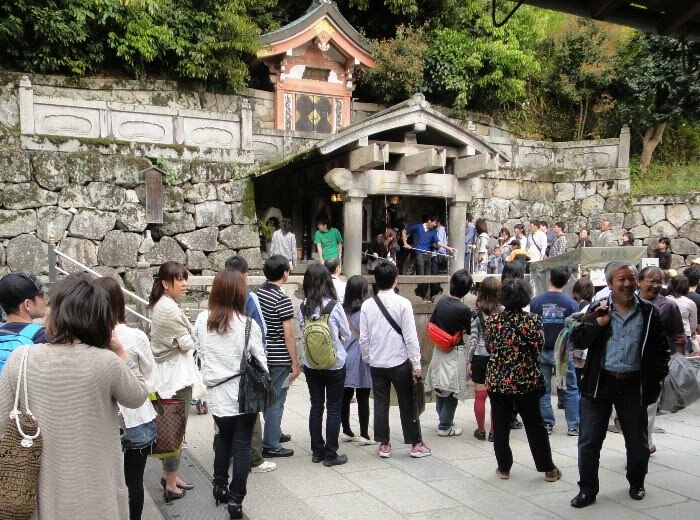 Jizo deity is the protector of dead children and travelers. Adjacent to Shakado hall to the south we saw another hall named Amidado. 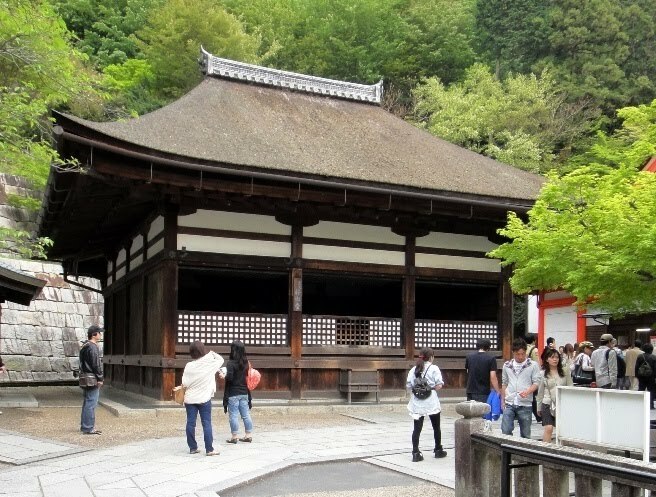 The hall was reconstructed in 1633 during Edo period. The painting of the building was restored in 1996 and therefore has a striking colorful red appearance. The hall has the traditional tiled roof structure of Buddhist temples. 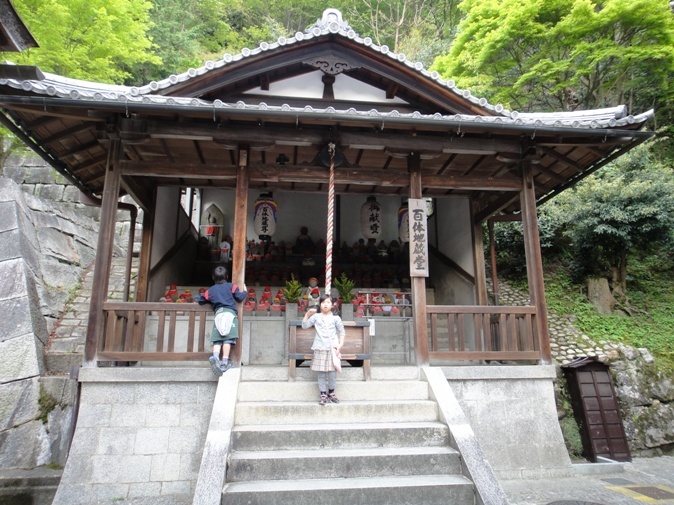 The principal image of the hall is a seated statue Amida Nyorai. The statue is brilliantly gilded and has a halo-shaped decor. To the south of this statue an image of Priest Honen, the founder of Jodo sect of Buddhism, is also enshrined. Adjacent to Amidado hall to the south is yet another hall named Okunoin. Earlier while walking towards Shakado hall, we glanced towards our right and got a beautiful view of Okunoin hall from its side. The hall resembles Hondo main hall on a smaller scale and also has a stage. 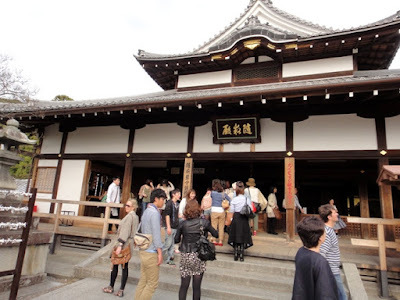 The present building was reconstructed in 1633 during Edo period. 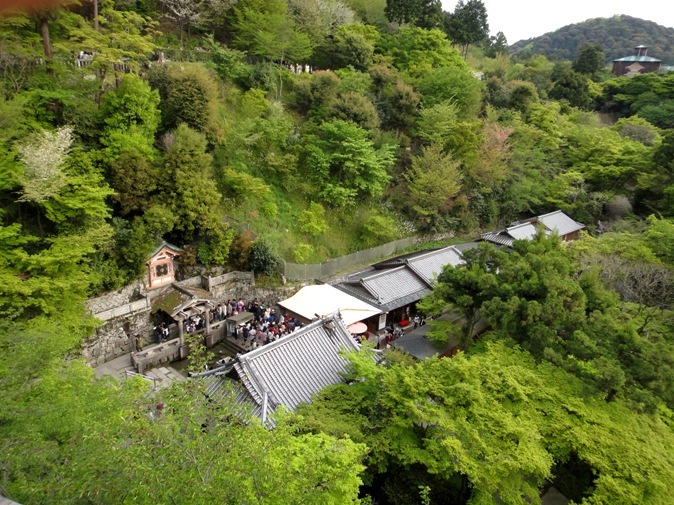 This site is said to be the original home of hermit Gyoei and the original crude structure that held the images of Kannon Bosatsu, Bishamonten, and Jizo Bosatsu carved by priest Enchin. Later the sanctuary of Tamuramaro also stood at this site while it held the three images. The hall is dedicated to these images even though they are now housed in Hondo main hall. While walking on the corridor of Okunoin hall, we could see the wooden scaffolds of its stage. On reaching the stage, we walked around for some time and enjoyed the beautiful views of the temple surroundings. Hondo main hall is located to the northwest of this hall. From Okunoin stage, we got a magnificent view of Hondo main hall and its Butai stage. Butai stage was full of visitors. 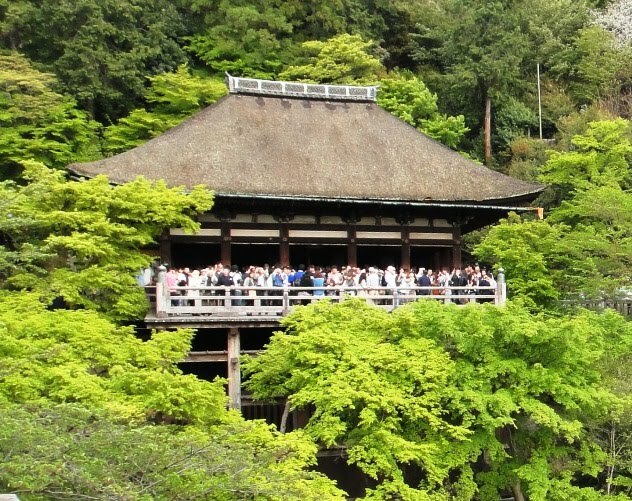 We took several photos of Hondo main hall from Okunoin stage. 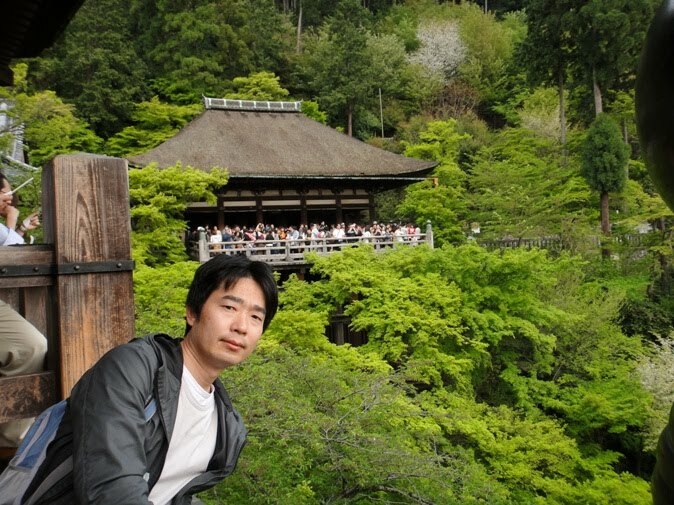 I am standing on Okunoin stage. Hondo main hall is seen in the background. 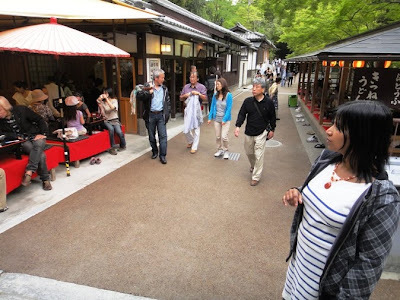 After enjoying the temple views from the stage of Okunoin hall, we continued our walk on the paved route. 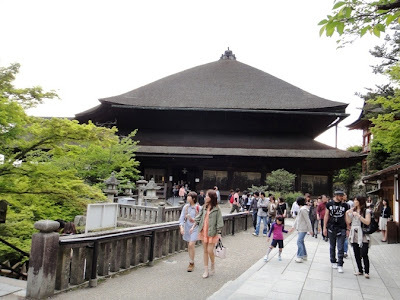 Soon we reached a spot on the southern part of the temple complex from where we got a nice front view of Hondo main hall and its Butai stage. Again, we took several photos of the main hall. 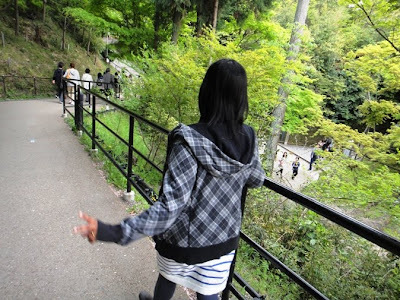 Then we started coming down the walking path and reached Otowa no taki waterfall located at the base of the main hall. Water from a spring in the mountain has been falling there since the foundation of the temple. 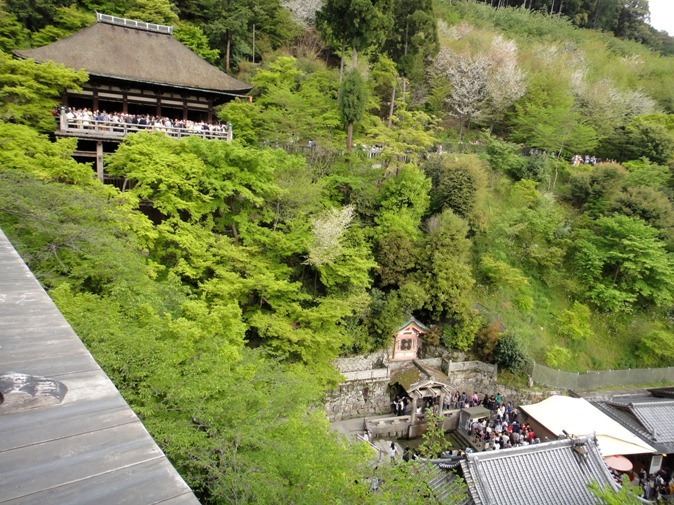 The temple’s name ‘Kiyomizu’, which means pure water, is derived from this waterfall. Three streams of very pure water fall into a pond. Each narrow stream is said to have a different effect. 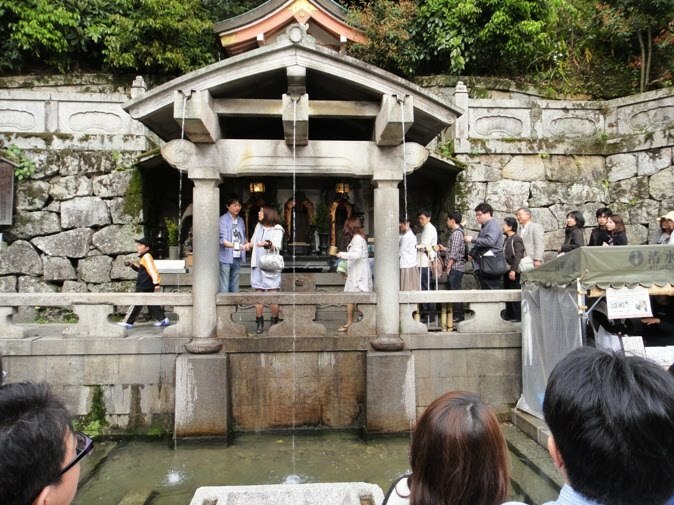 Visitors can collect the water from the falls in metal cups that are attached to long poles, and drink it for love, longevity, and wisdom. Traditionally, we should only choose two because it is considered being greedy to drink from all the streams. There was a very long queue of visitors waiting near the waterfall, so we skipped drinking the pure water from the streams. 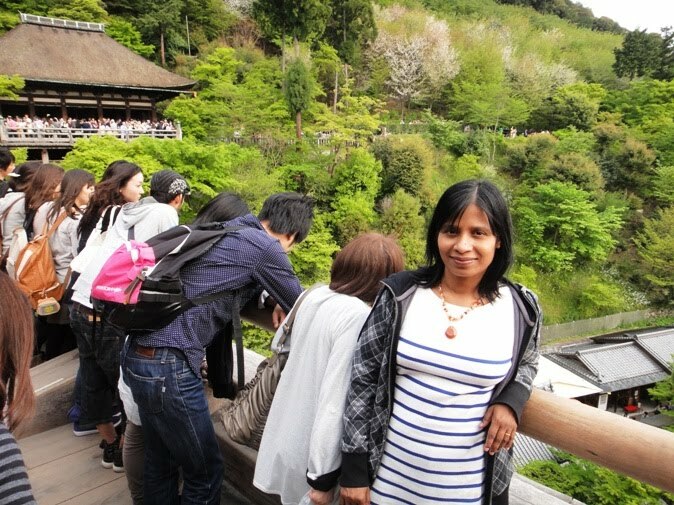 Next, we saw several souvenir shops and food stalls adjacent to the waterfall. At this point our tour of the temple complex was over. As we started heading back to the entrance of the temple, we saw the base of the massive wooden scaffolding that supports Hondo main hall. 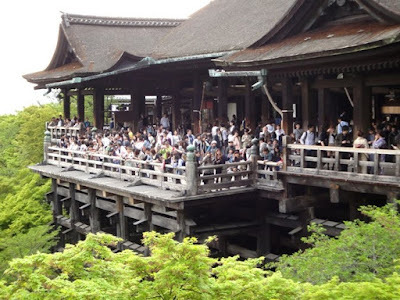 At about 5.30 pm we left Kiyomizudera Temple complex. We enjoyed visiting the temple. The next morning we visited Higashi Hongwanji Temple about which I will write in the next post. Nice pictorial coverage of Kiyomizudera Temple along with usual descriptions. Deguide, Thank you very much for a nice comment. 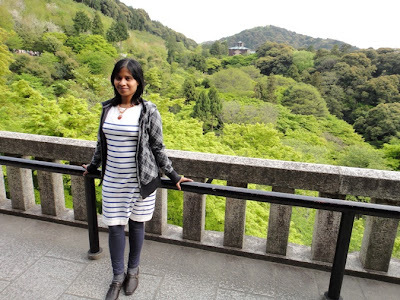 Hope you enjoyed the virtual trip Anindya. Manisha san Excellent tour of Kiyomizudera! Very useful for my visit in Oct 2017. 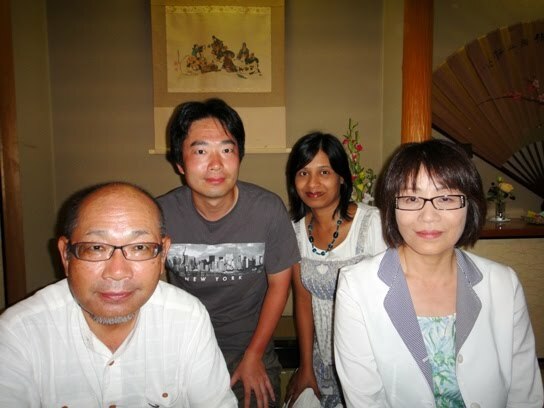 Where I can get your other blogs on Japan?